While one goal of the SIR Program is to reduce the need for chemical pesticides, there are situations where chemical intervention may be required. 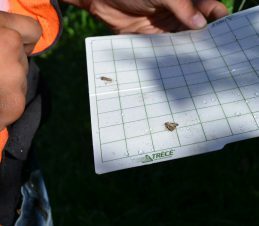 SIR Program staff provide information to growers on where infestations have been found (if any) and what wild codling moth traps have recorded in specific orchards and nearby areas. This information can help growers plan what codling moth control measures are necessary, including the use of chemical pesticides. Information about proper timing for codling moth sprays can be found on this Codling Moth Spray Timing and Lifecycle Factsheet: PDF: Codling Moth Spray Timing 2015. Orchardists should contact their field consultant for advice on how to control codling moth on their orchards. Control of codling moth can often be combined with control for other pests. Packinghouse field service staff or consultants have the expertise to advise orchardists on appropriate control measures. 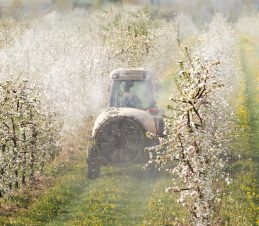 The SIR Program appreciates the use of spray warning notifications by growers so that staff can safely deliver services to orchards. Information about control products recommended for the codling moth can be found on this Characteristics of Codling Moth Control Products Factsheet: Characteristics of Codling Moth Control Products – Orchards 2017. All growers are reminded to keep accurate and up-to-date records of all pesticide sprays applied to the blocks they manage. You can use the forms developed by the BC Tree Fruits Cooperative (BCTFC) in the Integrated Fruit Production Guide or use your own record-keeping form that reports the same information as the BCTFC form. If you ship to the BCTFC, you must keep spray records in order to ship to the packinghouse as part of the on-farm food safety requirements as prescribed by CanadaGAP. The SIR Program, BCTFC field men and private advisors also need these records to uncover possible reasons for failures in codling moth control, and to also determine if growers are eliminating or reducing the number of cover sprays according to codling moth numbers in their blocks. It is well known that many pests can develop resistance to pesticides over time. To avoid development of resistance, growers are reminded to follow a pesticide resistance management (PRM) plan based on rotation of chemical groups. Information about pesticide resistance can be found on this Pesticide Resistance Management Factsheet: Pesticide Resistance.